Nineteen students accompanied Danielle Webster, an associate lecturer in the Department of Health Sciences, on an unique academic and altruistic venture to Jamaica in November. Webster’s students attended the seventh annual Society for Scientific Advancement conference, where they presented posters on research conducted while enrolled in an independent study course at UCF. The students also had the opportunity to volunteer with the organization’s STEM Talent Expansion through Promotion of Science, an international outreach science workshop, where they designed an innovative lesson plan for the primary and secondary students recruited for this outreach program. The workshop and scientific symposium were held at the University of the West Indies, Mona Campus, Kingston. 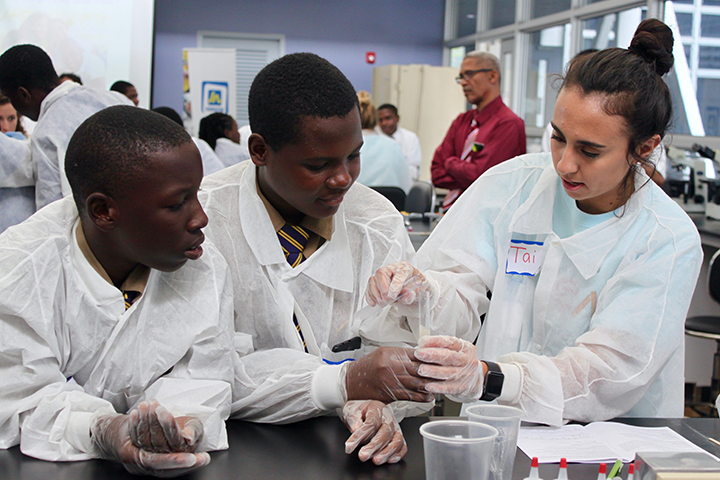 Last year, STEPS provided 180 Jamaican primary and secondary age students with rewarding, positive scientific experiences to boost their interest in STEM (Science, Technology, Engineering and Math) disciplines.